Membership of the Club is restricted to pupils at Mount Vernon Primary School, from Primary 4 upwards. Places are limited and currently all available places are allocated. Plain hunting is the next step in ringing. Once you can ring plain hunt, you are ringing real changes and are well on your way to being a proper bellringer. Plain hunting is the most simple ringing pattern, but in one way it is the hardest pattern you will learn, because it is the first pattern you learn. Plain hunting is the basis of almost all other ringing music, so once you know how to do this, you will be able to learn more complicated patterns more easily. The basis of change ringing is to make each bell change order with a neighbouring bell in a way so that no single order is repeated. There are several different ways to generate non-repeating rows. 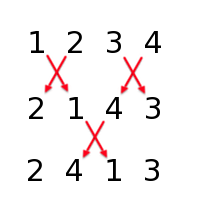 As an exercise, write down the numbers 1 , 2, 3, and 4 on a piece of paper and try to put these four numbers in as many different orders as you can find (hint: there are a maximum or 24 rows). This looks very straightforward. However if you tried to ring this on handbells, you would find it surprisingly difficult. Draw a line through each number to see the 'path' it traces. It is not very regular and you would have to count very carefully and it would be easy to lost your place in the whole pattern. In change ringing, we use a different system, which is to make as many bells change places as possible. It is also possible to generate all the possible orders by using a combination of very simple rules. The rules ensure that as many bells move position as is possible without repeating, and also ensure that each bell only moves one position at a time. In the case of 4 bells, this means swapping the first two and the last two bells. What next? If we apply Rule One again, what will happen? That's right - the bells will come back to rounds again, which is fine but very short. Now that you have a third and completely different order, you can do Rule One again. Try to write out the orders, alternating Rule One and Rule Two, until you get back to rounds again. (hint: you will get 8 different orders). You have written out Plain Hunt on 4 bells! Take some coloured pencils and trace through the path of each number. What kind of pattern does it make? That's right - it makes a very regular pattern, and regular patterns are easy to learn and easier to ring. The same rules apply if you have six or either bells. Try using our plain hunting worksheets to help practise the rules of plain hunting. Wait a minute....what about the rest of the pattern? Oh, good question. I said earlier that there was a maximum of 24 different orders that you can make using just four items. But our rules of plain hunting make only 8 orders. How do we get the rest? The answer is that you have to apply a third rule. Can you find a Rule Three that will give you all 24 possible orders?